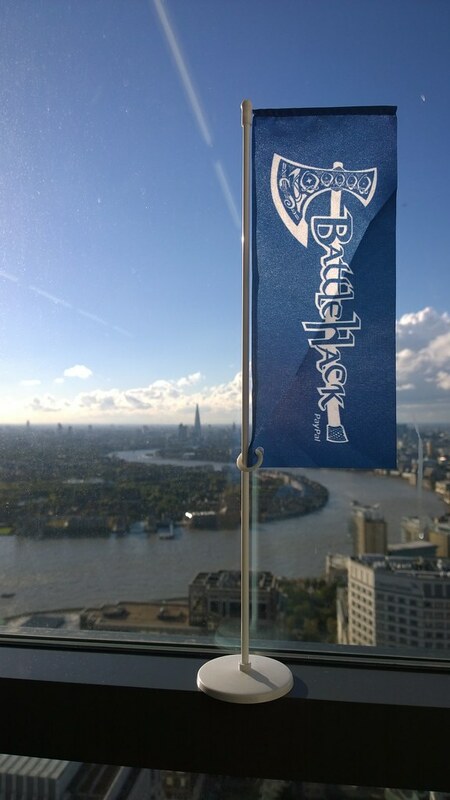 Last weekend I attended BattleHack, an annual hackathon held by PayPal to find the best hackers in each country around the world and bring them together for a final showdown at a chance of winning a crazy $100’000 in PayPal credit. 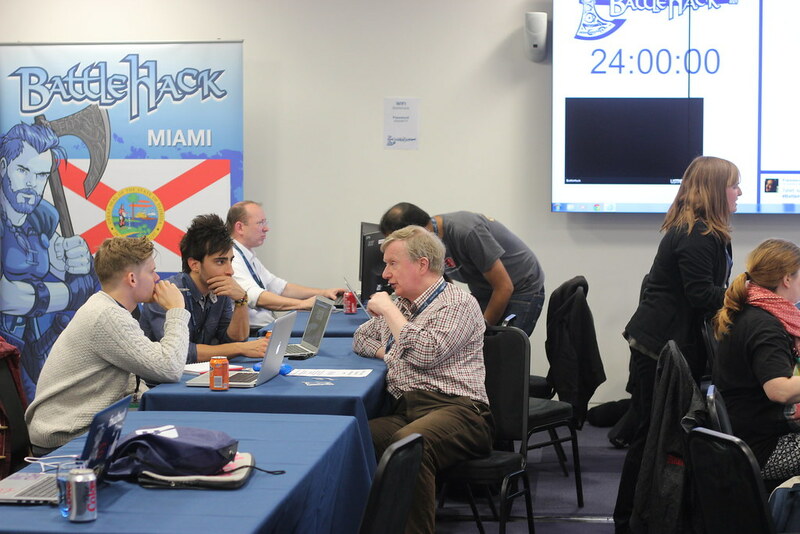 This hackathon was the London hackathon where the winning team would be sent to Silicon Valley for the world final. 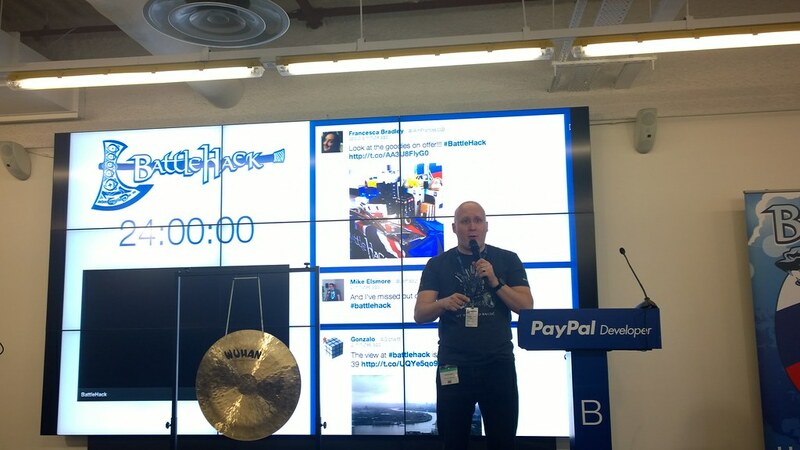 The goal was simple; build a hack in 24 hours using the PayPal/Braintree API to help solve a local problem. The sponsors included SendGrid, Twilio, relayr, Context.IO, JustGiving and NFC Ring who each enabled hackers to build something using their technology. A nice touch was relayr who gave us access to their new WunderBar electronics kit, the team were really great guys. 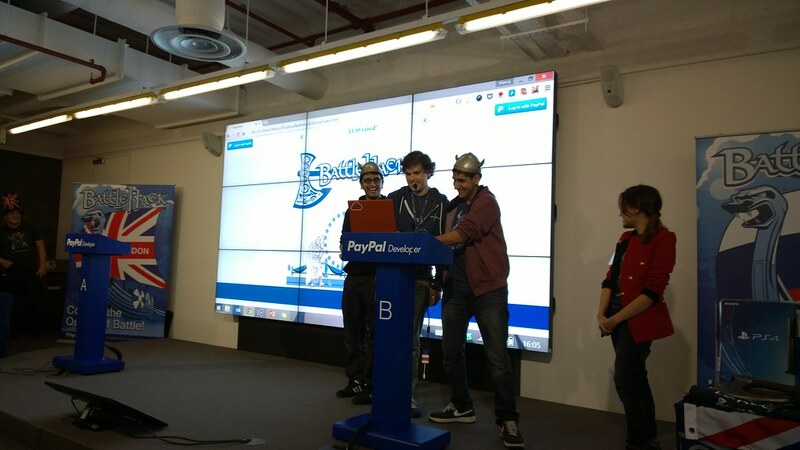 Paypal’s message was clear, the judging was strictly based on the technology used and its social impact. They wanted to see what you made and the tech used to build it. 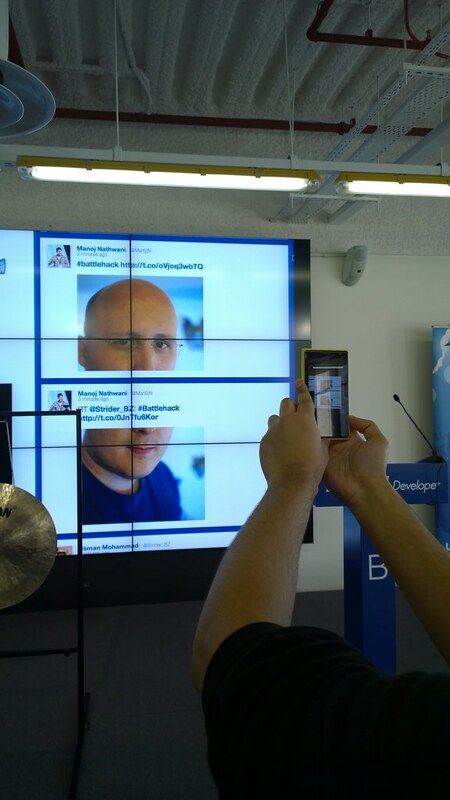 A hackathon where PowerPoints would lose you points – PERFECT! 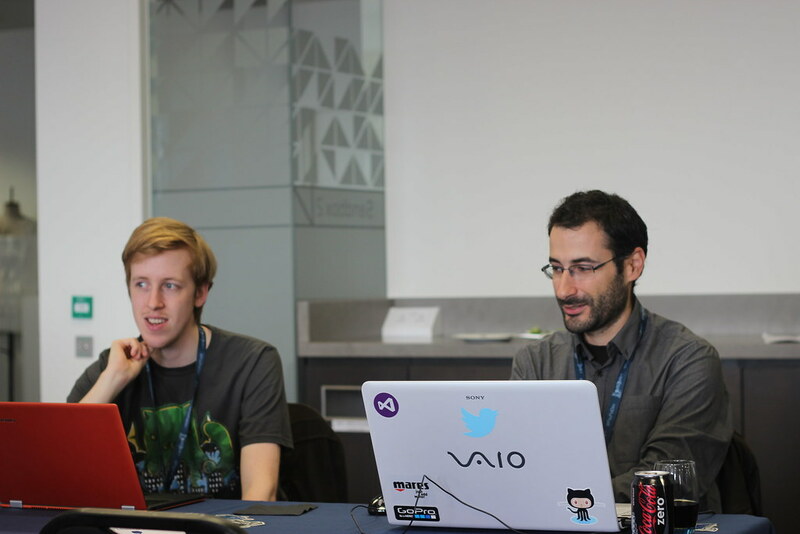 The hackathon was run for developers, by developers which gave the entire event a really fun and open environment. There were plenty of cool projects scattered around the venue made of Arduino robots mimicking dragon-flies or an oculus rift device surrounded by fans to give the impression that you were flying! It really was an amazing place to be. 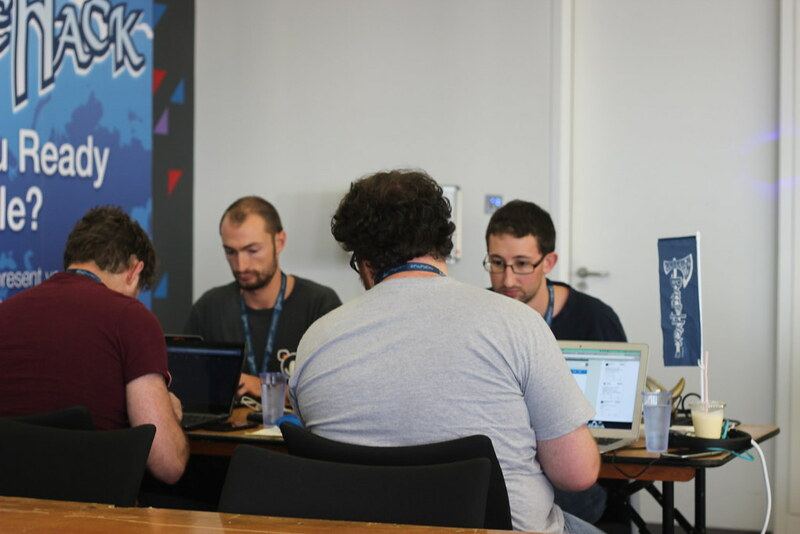 The hackathon took place at Level39 and managed to use the entire floor to hold the 250+ hackers who attended the event. 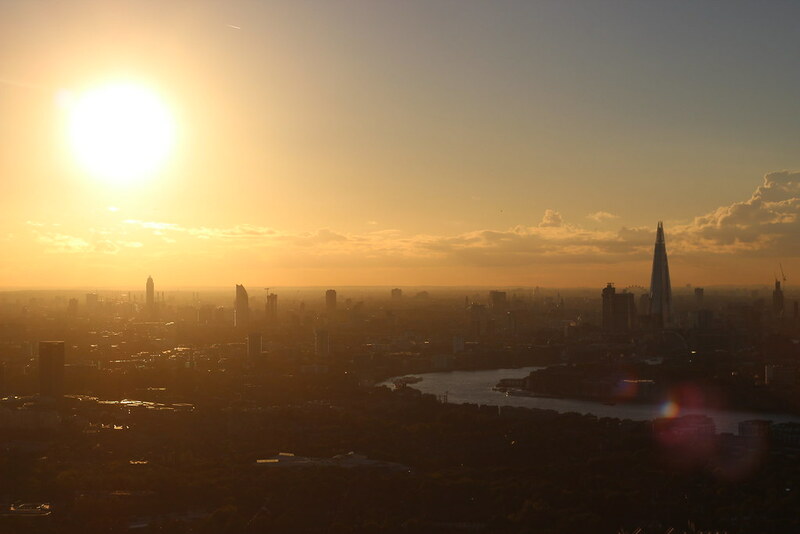 I’ve been to Level39 a few times before but had never seen the entire floor open, watching the sun set over London is really a must-see from such a location! 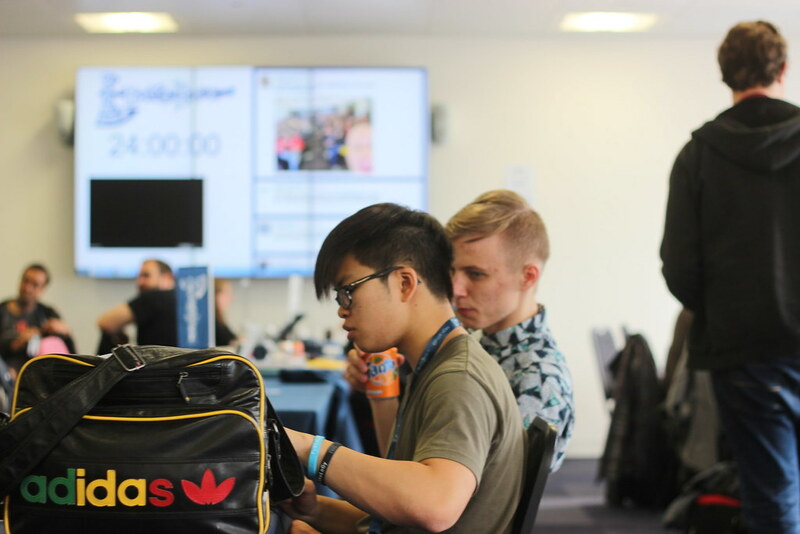 There were screens in each room showing a twitter feed of the event, a livestream of Cristiano putting hats on people and a big countdown to the end of the hackathon which really put on the pressure as it ticked away. There were a few people who set up some cool time lapse videos on YouTube here and here which look incredible as well as this cool time lapse video of a Suitable Beam's remote presence device whizzing around. 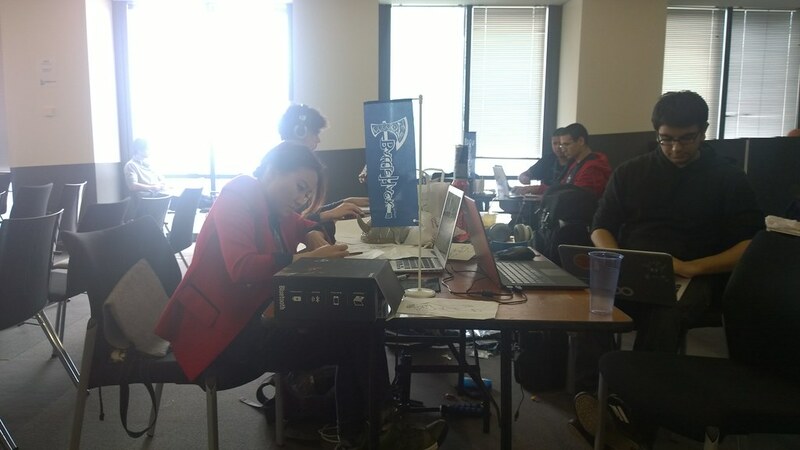 Battle Hack really went the extra mile by adding small touches such as a dedicated sleeping room with airbeds and cushions as well as calling in masseuses to give free massages in the evening. 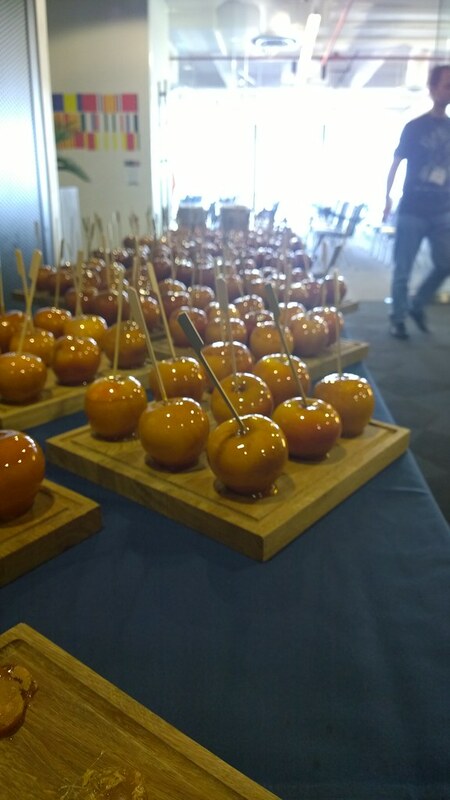 The food at BattleHack was by far the best hackathon food ever. 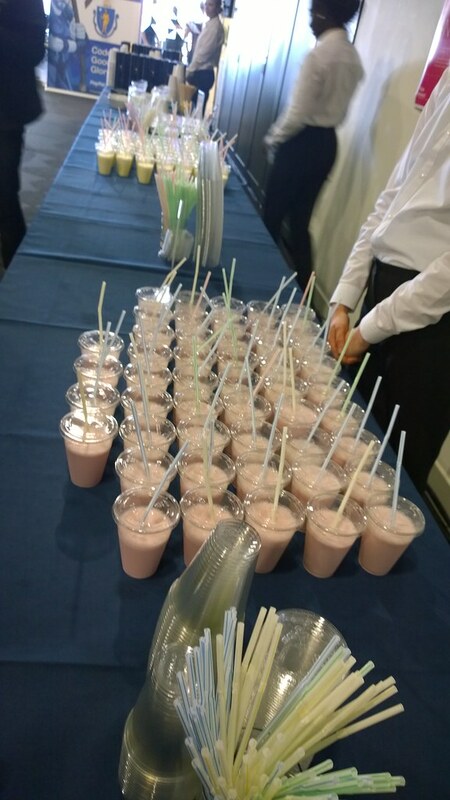 It was mentioned at the beginning that they love their food and that there would be a lot of it which sounded scary at first as hackathon food usually is dangerously unhealthy but as it turns out, there was a lot of food yes, but it was all good quality healthy food. The fact that there wasn’t a single mention of pizza is on its own an accomplishment for the hacker community. I think we’re all a little sick of the same old Domino’s pizza. Of-course the pictures I’ve taken are the some of the treats which were up for grabs such as candy floss, caramel apples, milkshakes and BattleHack muffins, but each meal (including second dinner (yes that's a thing now)) was proper cooked hot food. This really helped us work better and improved our overall experience. 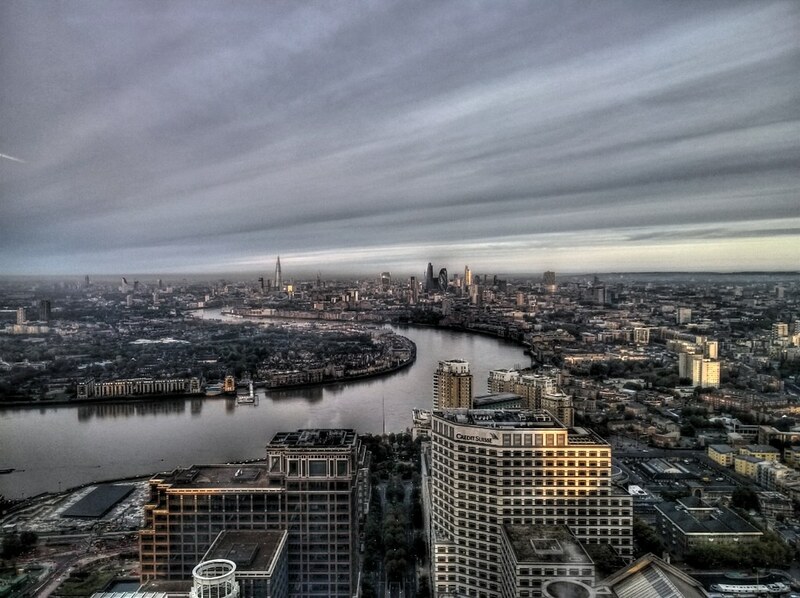 I really think the Level39 crew deserve a lot of credit for this as it is one of the biggest reasons I love going there… besides the view! The food is always great. Firstly we took Cristiano’s head and chopped it in two and tweeted it. As it appeared on the screens in every room we took another picture of it. 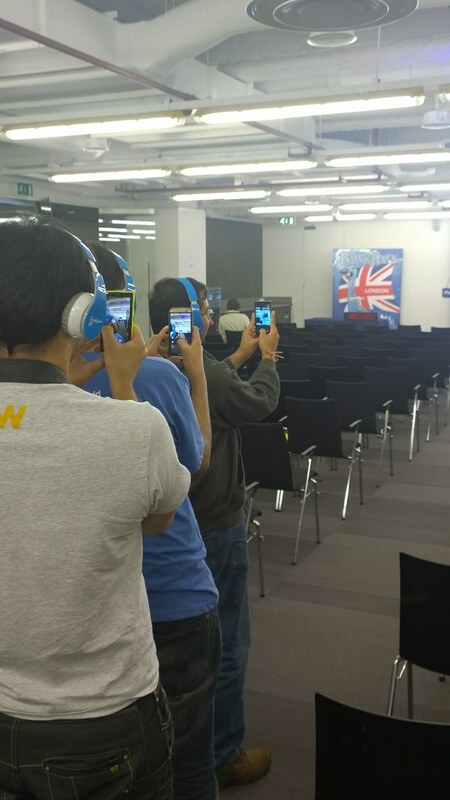 We then had Sidd taking a picture of them while usman took a picture of it while I took a picture of it. We then all tweeted our pictures in order. 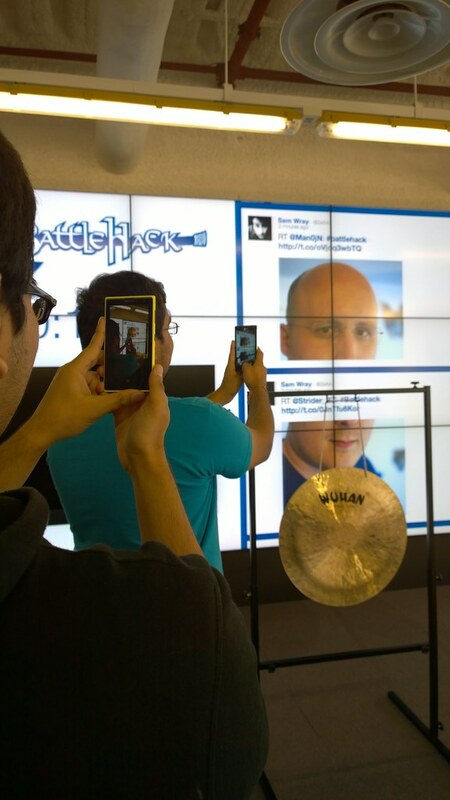 We won the competition with the last tweet and made yet another photoception tweet while wearing the headphones we won! For our hack we continued our recent method of brainstorming by thinking off interesting tech which we had never tried out before and wanted to try out. I’ve always wanted to build a game using HTML5 and Canvas and I finally got the chance to thanks to Anthony, Usman and Lexi all jumping at the idea of building a game! We decided on building a street-fighter-like game where hitting your opponent would force them to pay 10p to charity through JustGiving. This would also make good use of the PayPal's API by including payments as well as the JustGiving API to send money to charities. While starting off, Lexi mentioned she could help out with the design. Little did we know she had the graphics skills of an artist and offered to draw the entire game by hand frame-by-frame. We decided to use the official BattleHack characters for our game and hopefully finish by the 24-hour deadline with a fully working game. 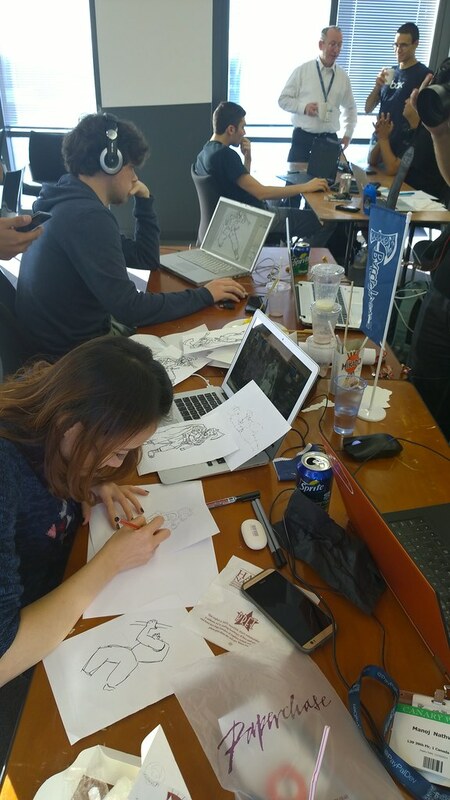 Our team soon turned into a fully-equipped gaming studio with Lexi drawing each character a frame at a time, Usman taking a picture of the drawing, Anthony importing the images and turning them into usable graphic and myself building them into the game and adding interaction. Usman spent a LOT of time working on our PayPal integration which would allow users to log into their account before starting the game while I managed to make fairly quick progress with learning how to build a basic game. The issues for developing the game came in when trying to run complex tasks such as having multiple characters moving, collision detection, event handling and score counting, which I had to program in myself. In the future I would probably use a platform which hides a lot of this ugly work in the background by doing it for you. In the end we managed to get a working game! It went surprisingly well with both characters professionally working with their hitting, blocking, falling and victory dancing animations working flawlessly. Our presentation went great! The game worked without any bugs and the crowed seemed to love it. The judges loved how we used their brand’s characters and integrated JustGiving to raising money for charities in a fun way. 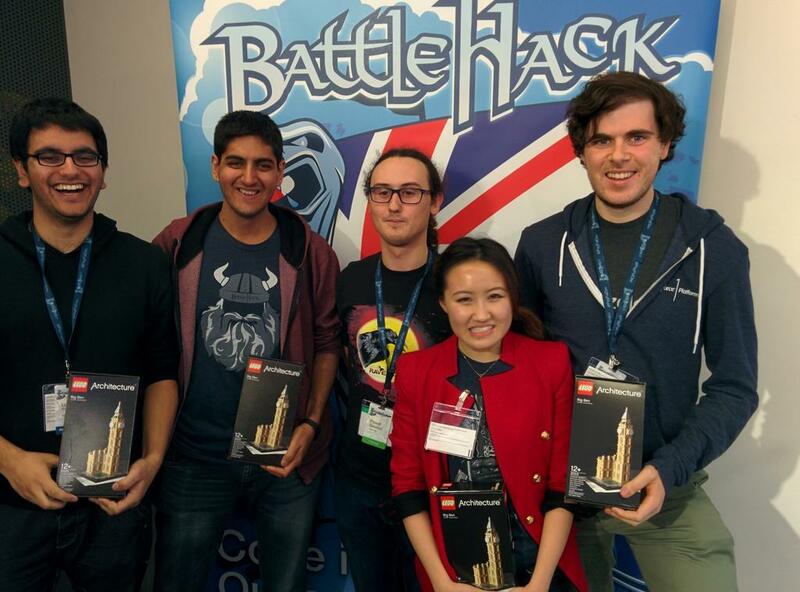 In the end we won the best charity hack by JustGiving who awarded us each with a Lego architect set. 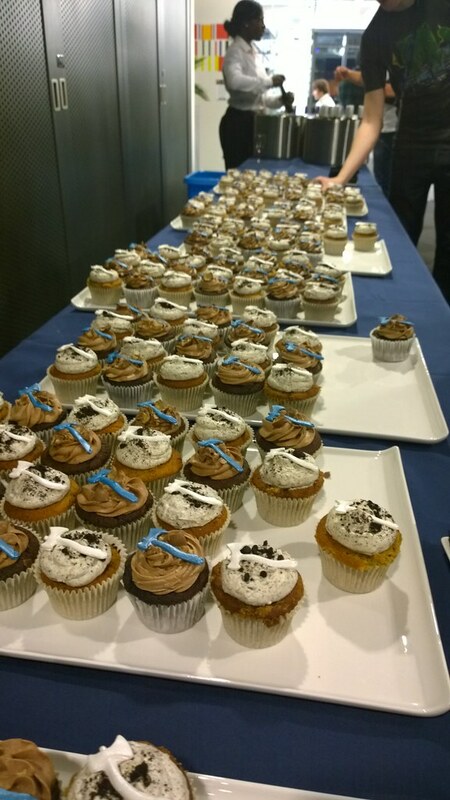 In conclusion: we learnt a lot, ate a lot, laughed a lot while raising a little bit of money for charity. A weekend well spent.